AZ Locksmith is an approved & authorised locksmiths london company with many years of experience. We provide emergency and standard security services for all your automotive, residential and commercial needs. We offer 24-hour mobile locksmith services, 365 days a year, including weekends and public holidays. Our licensed technicians can do any job on-site, including car key replacement, programming, duplication, and locking issues with window, UPVC doors, garages, safes, mailboxes, and much more. We use GPS technology to find and dispatch the nearest locksmith to your location, minimising waiting time. Our security specialists operate in the same neighborhoods to make sure that you receive swift and professional service for your car, home, or business. One of the reasons why people choose AZ Locksmith is our affordable and flat prices. We have the most competitive prices in the area and we don’t charge any extra fees. You will know the total cost before we provide the service. Each of our technicians is licensed and has years of training and experience. Our locksmiths systematically upgrade their knowledge and equipment. We always ensure that all our employees have a clean history with no court records. Our security experts have all appropriate tools and hardware to do any job quickly and accurately. Our master locksmiths provide all types of lock and security solutions for vehicles, houses and business places. We use only top-grade and brand-name parts and products. Our technicians choose the most reliable type of locks and offer you the best security options according to your individual needs. Moreover, all of our services and products are covered by a 1-year guarantee. 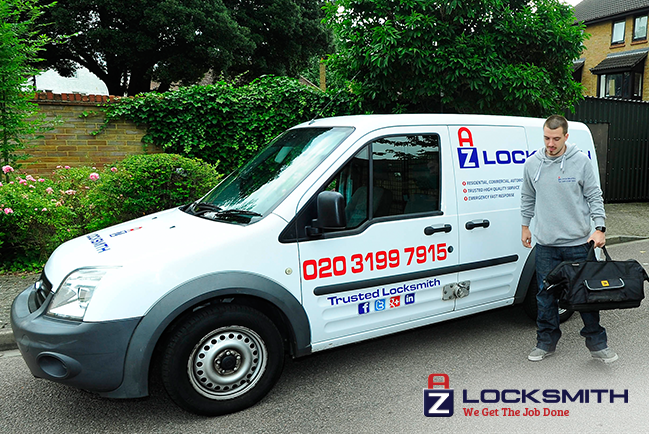 If you need a professional automotive, residential or commercial locksmith service, contact us now at (020) 3199-7915. We are ready to assist you anytime, round the clock, 365 days a year!